The world recently experienced a moment of history in the making — at least in terms of the fashion world — when model and body image activist Harnaam Kaur, who has Polycystic Ovarian Syndrome, became the first fully bearded female model to walk a runway show. For over a year now, efforts of the body positivity movement have taken our culture by storm, encouraging individuals of all shapes and sizes to embrace who they are and how they look, no matter what images mainstream media try to push on them. But the movement isn't only about ending size discrimination. It's about re-conditioning people to learn that all parts of their bodies — including scars, gender identities, and body hair — deserve acceptance and care. To me, that is why Kaur is a body positivity role model. Kaur walked a runway with her full beard, strutting down the catwalk for jewelry designer Marianna Harutunian at London Fashion Week and showing women everywhere that the beauty standards we hear about today don't need to stick around. According to Yahoo! Style, Harnaam's facial hair is predominently down to her PCOS. "Harnaam has Polycystic Ovarian Syndrome, a hormonal condition that can cause excess hair growth. Having first started to grow facial hair when she was 11, Harnaam used hair removal treatments to take it off until she was 16. After years of feeling shame and battling bullies, she had a change of heart, deciding to accept her body as it was — facial hair and all." I cannot help but feel that the word "accept" doesn't feel quite right in this instance. 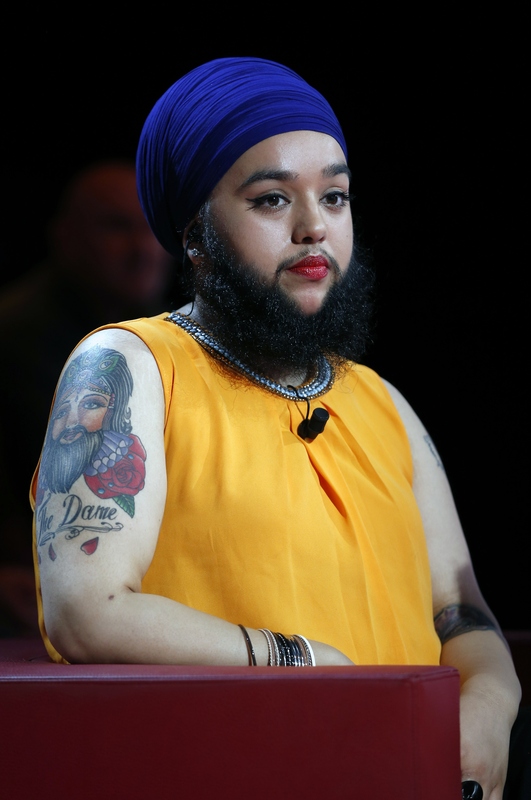 Kaur didn't just become OK with her facial hair. She totally celebrates it. Kaur told wedding publication Rock 'N Roll Bride, "People just see the beard as hair, but my beard for me is much more than that. I keep my hair to show the world a different, confident, diverse and strong image of a woman." The Daily Mail further reported Kaur's feelings about her look. She told the publication, "It makes me feel like a brave, confident woman who isn't afraid to break society's norms." And break them she does. On her Instagram, she shared her thoughts on the runway experience. She wrote, "I grew up being told I was too fat, ugly, and disgusting to even model. I was told I'd never walk the runway. I used to look at models and tell myself that I will never ever be able to do what they are doing. I am not pretty enough or beautiful enough and I don't have the 'right' body type. I was laughed at when I said I wanted to model. Joke's on my bullies." On that runway, she looked every inch the strong, confident woman who fully accepts and appreciates herself, no matter what society would like her to believe. She told her followers on Instagram, "Every path is my runway! Walk with your head up high and ooze confidence always!" When watching Kaur embrace herself so fully, it's hard not to want to take her advice.